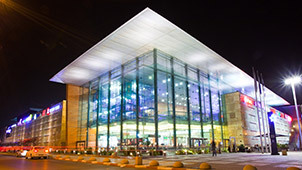 The Seven Stars Mall in Herzliya, which has been operating since 2000, is the flagship mall of the ILDC Malls Division. The mall is one of the leading malls in Israel and is considered a successful mall. The reputation of a dependable company, the entrepreneurial and efficient management, and an outstanding marketing ability have joined to secure full occupancy in the mall. The mall has 5 floors, of which three are commercial floors with restaurants, a bowling alley, a gigantic supermarket, gym and stores of various types. The total area of the mall is 88,000 sqm, of which more than 26,000 sqm (net) is commercial grounds and an underground parking lot with 1,500 parking spaces. The mall has branches of leading chains of Israeli and international brands, including: Fox, Castro, Laline, Pull & Bear, mango, celio and H&M. The mall operates seven days a week and offers its visitors a great variety of quality content events for all ages, such as food fairs and baby festivals, a wide range of activities for children of all ages: plays, performances, cooking workshops, art workshops, workshops for infants and their parents and numerous other attractions that vary throughout the year.